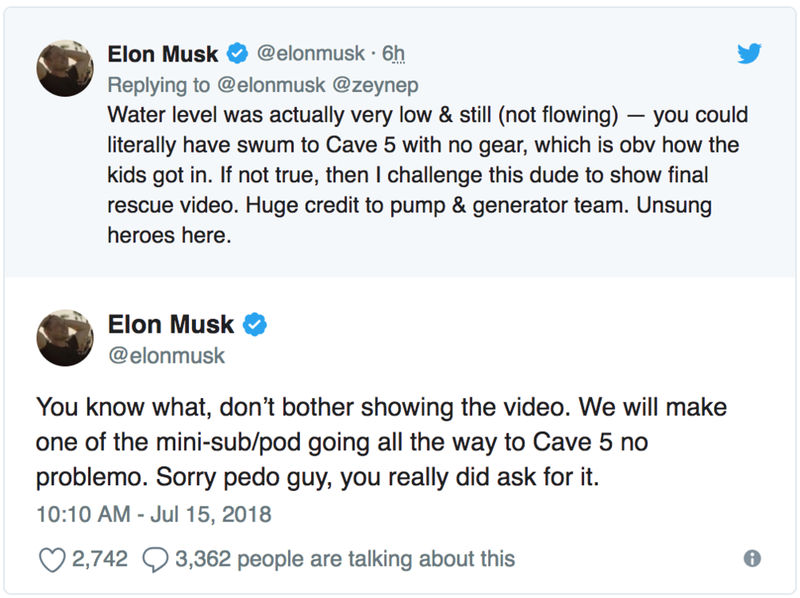 Elon Forgets to Switch Accounts Before Calling Rescue Worker "Pedo"
During a brief Twitter spat with one of the men who rescued a Thai soccer team from an underwater cave system, Elon Musk threw out the phrase "pedo guy." That tweet has since been deleted, but through the power of investigative journalism, I have it right here! Reader, if you have half a brain, you're probably thinking, "There's no way a grown leader of three billion-dollar companies would stoop to the level of accusing a hero of kiddy diddling, and with no proof," and you'd be right. See, there's a simple explanation to all this: Elon meant to post that insult from an alt account. For those not "with it," an alt account is something that a Twitterer uses to post their darkest deepest thoughts without consequence, usually racist and/or perverse in nature. The alt will typically have an ironic handle like AdorableDeplorable, YiffingForJesus, or Adam3154987097. These accounts always, ALWAYS, have one of three varieties of profile picture. 1. Their favorite video game tough guy, such as Kratos or Master Chef from the War of War series. 2. A prepubescent cartoon girl. 3. A commissioned piece of art for their "Fursona." It may just be a hunch, but I'm at least 3% sure that Elon does a lot of posting under one or many of these alts. As Musk loses more and more fans each day, it's almost a necessity. The only other explanation is that a genius like him would willingly make himself look like an ill-mannered idiot in a public space.